GRAND CHUTE, WI - The Wisconsin Timber Rattlers are ready to announce their 2019 schedule. The Milwaukee Brewers Midwest League affiliate will open their 2019 season with two games at Beloit on April 4-5. The Rattlers will open the home portion of their 2019 schedule with two games against the Cedar Rapids Kernels at Neuroscience Group Field at Fox Cities Stadium on April 6-7. The home opener on Saturday, April 6 has a scheduled first pitch of 4:05pm. The entire 2019 schedule with the start times for all 70 home games may be viewed as a PDF at this link on timberrattlers.com. The first 1,000 fans to attend each of Wisconsin's three remaining home games - August 29 through August 31 - this season will receive a 2019 magnet schedule courtesy of Trilliant Food. The 2019 home schedule breakdown by month is: Twelve games in April, seventeen games in May, ten games in June, thirteen games in July, and eighteen games in August. The 2019 home schedule breakdown by day is: Ten games on Sunday, nine games on Monday, eight games on Tuesday, eleven games on Wednesday, ten games on Thursday, eleven games on Friday, and eleven games on Saturday. 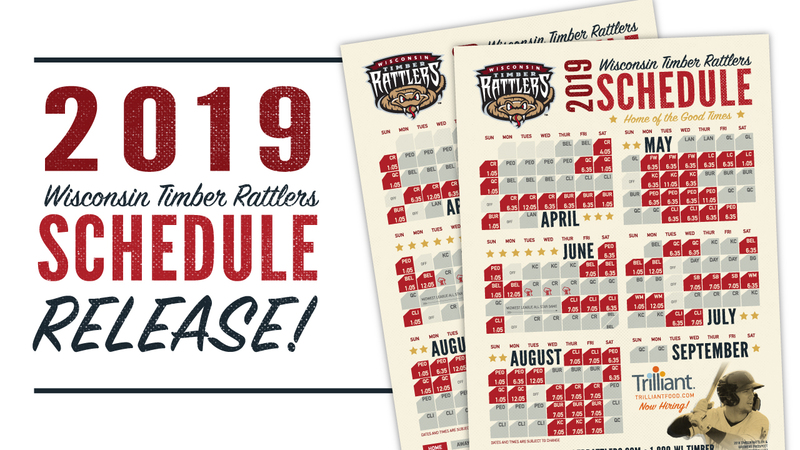 Full Season and Half-Season ticket packages for 2019 are available from the Wisconsin Timber Rattlers ticket office by calling (800) WI-TIMBER or (920) 733-4152. The smaller 7-game and 10-game packages are also available. The Timber Rattlers will announce their entire promotional calendar with fireworks, giveaways, and specialty nights in February, 2019. However, keep your eyes on timberrattlers.com for announcements of bobblehead packages, Christmas packages, and more special ticket offers for the 2019 season.